Director; Pinatel Piece Dye Works Ltd., Joliette, Que. 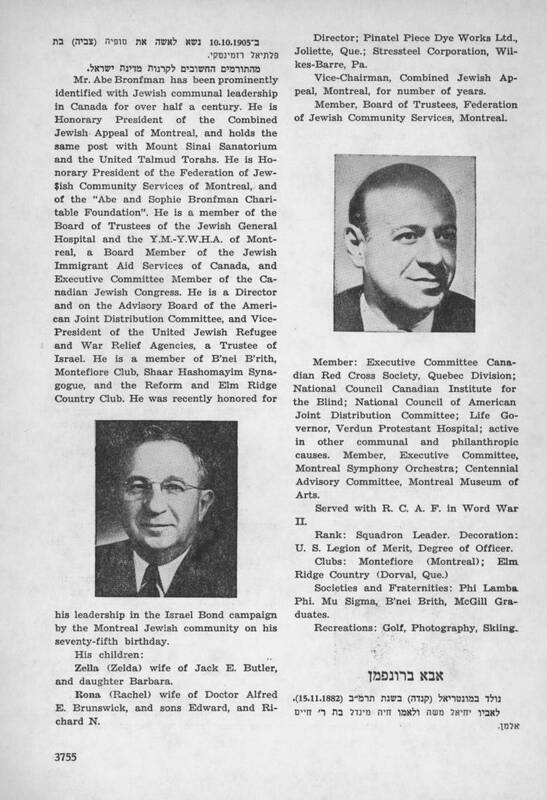 ; Stressteel Corporation, Wilkes-Barre, Pa. Vice-Chairman, Combined Jewish Appeal, Montreal, for number of years. 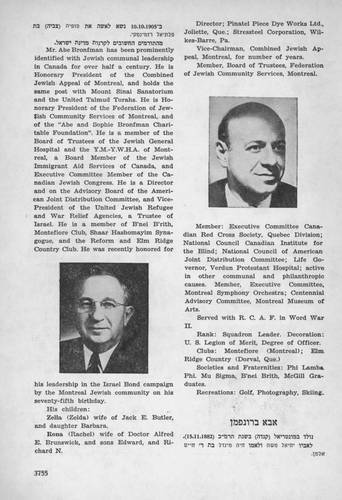 Member, Board of Trustees, Federation of Jewish Community Services, Montreal. Member: Executive Committee Canadian Red Cross Society, Quebec Division; National Council Canadian Institute for the Blind ; National Council of American Joint Distribution Committee ; Life Governor, Verdun Prote3tant Hospital ; active in other communal and philanthropic causes. Member, Executive Committee, Montreal Symphony Orchestra; Centennial Advisory Committee, Montreal Museum of Arts. Served with R. C. A. F. in Word War .II Rank: Squadron Leader. Decoration: U. S. Legion of Merit, Degree of Officer. Clubs : Montefiore )Montreal( ; Elm. Ridge Country )Dorval, Que. ( Societies and Fraternities : Phi Lamba. Phi. Mu Sigma, B'nei Brith, McGill Graduates. Recreations : Golf, Photography, Skiing. נולד במונטריאל (קנדה) בשנת תרמ"ב (15.11.1882). לאביו יחיאל משה ולאמו חיה מינדל בת ר' חיים אלמן. ב-10.10.1905 נשא לאשה את סופיה (צביה) בת פלתיאל רזמינסקי. Rona )Rachel( wife of Doctor Alfred E. Brunswick, and sons Edward, and Richard N.